(Nanowerk News) Since its discovery, graphene—an unusual and versatile substance composed of a single-layer crystal lattice of carbon atoms—has caused much excitement in the scientific community. Now, Nongjian(NJ) Tao, a researcher at the Biodesign Institute at Arizona State University has hit on a new way of making graphene, maximizing the material's enormous potential, particularly for use in high-speed electronic devices. Along with collaborators from Germany's Max Planck Institute, the Department of Materials Science and Engineering, University of Utah, and Tsinghua University, Beijing, Tao created a graphene transistor composed of 13 benzene rings. 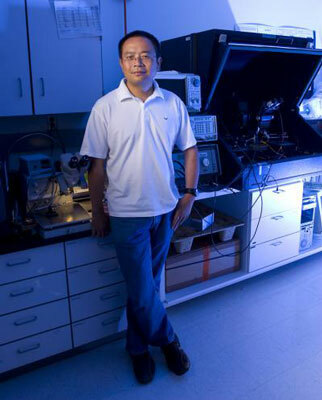 Dr. Nongjian Tao is a researcher with the Center for Bioelectronics and Biosensors at the Biodesign Institute, Arizona State University. The molecule, known as a coronene, shows an improved electronic band gap, a property which may help to overcome one of the central obstacles to applying graphene technology for electronics. The group's work appears in the June 29 advanced online issue of Nature Communications. "Graphene is an amazing material, made of carbon atoms connected in a honeycomb structure," Tao says, pointing to graphene's huge electrical mobility—the ease with which electrons can flow through the material. Such high mobility is a critical parameter in determining the speed of components like transistors. In each case, an intrinsic property of graphene must be overcome for the material to be suitable for a transistor. As Tao explains, "a transistor is basically a switch—you turn it on or off. A graphene transistor is very fast but the on/off ratio is very tiny. " This is due to the fact that the space between the valence and conduction bands of the material—or band gap as it is known—is zero for graphene. In order to enlarge the band gap and improve the on/off ratio of the material, larger sheets of graphene may be cut down to nanoscale sizes. This has the effect of opening the gap between valence and conductance bands and improving the on/off ratio, though such size reduction comes at a cost. The process is laborious and tends to introduce irregularities in shape and impurities in chemical composition, which somewhat degrade the electrical properties of the graphene. "This may not really be a viable solution for mass production," Tao observes. Rather than a top down approach in which sheets of graphene are reduced to a suitable size to act as transistors, Tao's approach is bottom up—building up the graphene, molecular piece by piece. To do this, Tao relies on the chemical synthesis of benzene rings, hexagonal structures, each formed from 6 carbon atoms. "Benzene is usually an insulating material, " Tao says. But as more such rings are joined together, the material's behavior becomes more like a semiconductor.